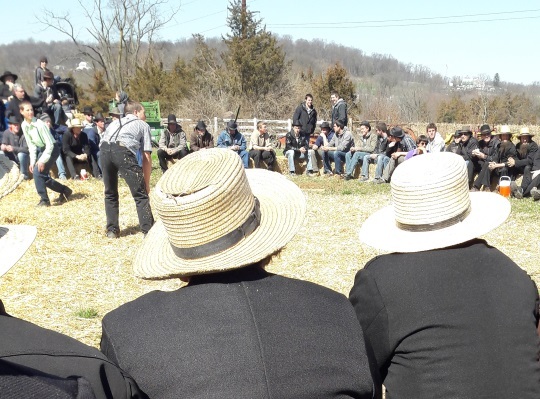 Nearly 10 years ago we had a post about corner ball, a traditional game played by Amish and Old Order Mennonites. 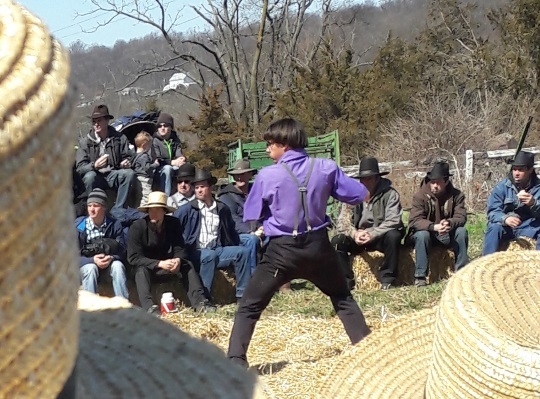 I had long heard of this game – described in depth by Richard Stevick in Growing Up Amish: The Teenage Years – and had always wanted to see it “live”. Fortunately, I had a chance to do just that on my recent visit to Lancaster County. It happened that a game was scheduled for the Saturday before Easter. 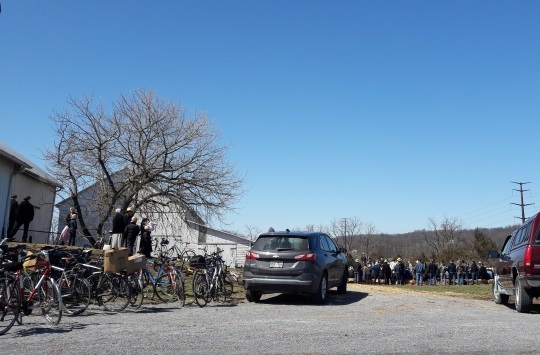 The day before, an Amish friend mentioned that he wanted to attend (he’s a dairy farmer and can make his Saturday afternoon open between milkings). 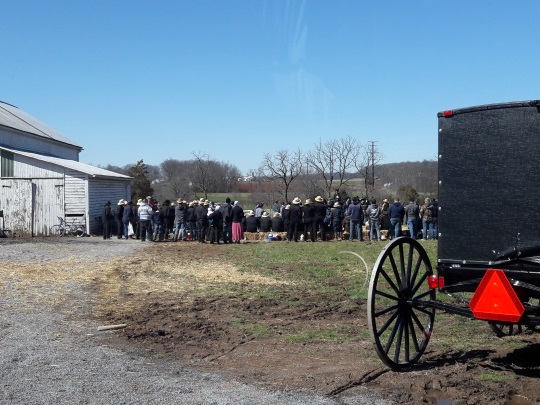 It was to take place in Fivepointville, an area in northeastern Lancaster County populated heavily by Old Order Mennonites, a bit far to reach by buggy. So of course I offered my services as a (free) Amish taxi. 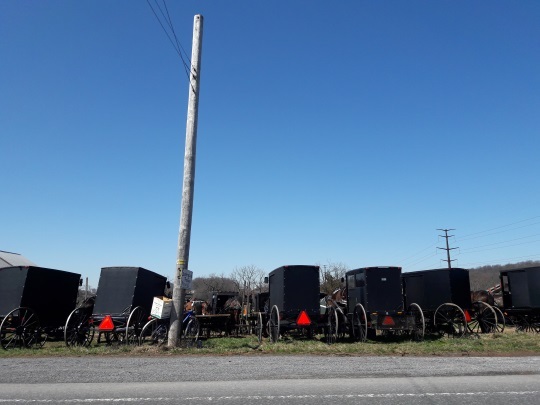 There was an auction going on at the same time at the Fivepointville firehouse, which was maybe a mile, if that, down the road from the Old Order Mennonite farm where the game was taking place. 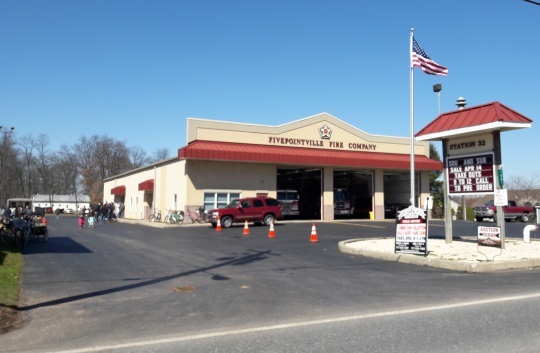 Fivepointville itself is a sleepy little borough, named for the junction of five roads which meet at its center. My friend was not exactly sure where the game was being played. 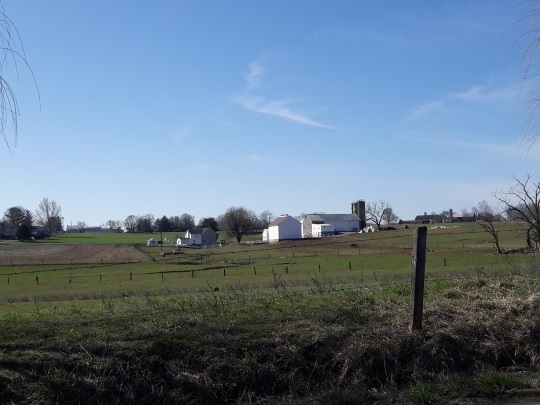 But we were able to find our way easily enough by following the traffic – both buggies and bicycles ridden by Mennonites. We soon found the farm where the day’s action was taking place. Once we reached the farm, we found two games ongoing. There was the main game, with youth-age participants (from around age 16 to I’d guess early-20s), and one for younger children (let’s say 10 years and up). 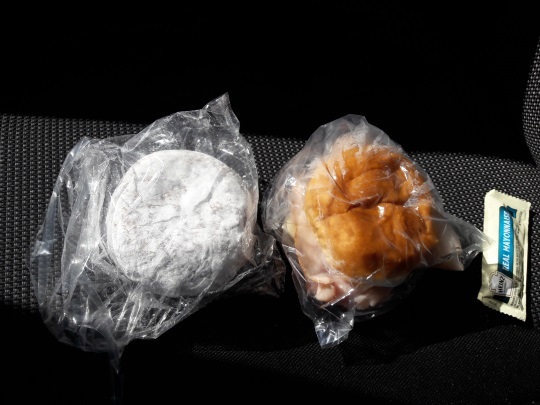 They also had a stand set up selling sandwiches, drinks, and donuts. Couldn’t skip that. So on to the game itself. Corner ball is called Eck balle in Pennsylvania Dutch. Briefly, here’s how the game works, from what my friend explained to me, and what I was able to discern. Teams consist of 6 players each. 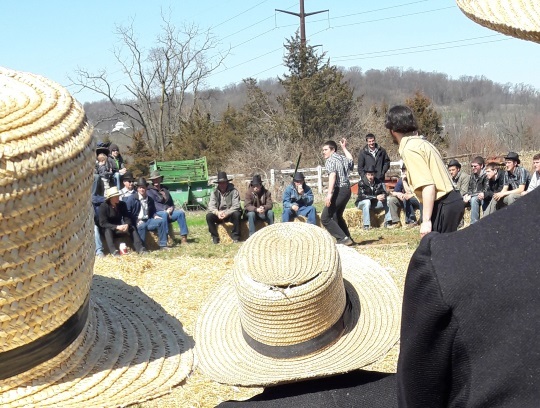 Amish teams typically play Old Order Mennonite teams. 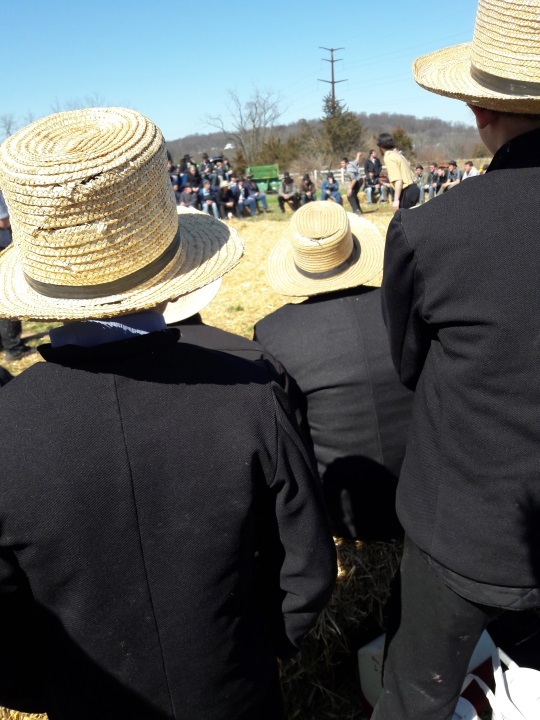 The games were certainly competitive, with quite a few spectators – including Amish and Mennonite men, and some women in attendance as well – rooting on the respective sides. Four players from one team (Team A) take up spots on the corner of a roughly 25-by-25 foot square area. This surface has been covered in straw (good corner ball players are adept at acrobatic jumps with the inevitable hard landings, hence the soft cushion to break falls). Two players from the second team (Team B) take up positions inside the square, where they are able to move about to avoid the ball. The ball is specially made, and from what I could tell had what appeared to be a brownish leather covering, about the size of a baseball (though not as hard). Players from Team A toss the ball back and forth from one corner to the next, while the pair from Team B move about with the action of the ball, trying to read what the player with the ball will do. Team A is looking for a good shot – and when one of them feels he has it – he then rockets the ball at his target. If he hits his target, that player is out, and is replaced by another player from Team B. This continues until the team exhausts its supply of bodies. If he misses, he is out, and Team A loses a “corner” – they now must play with three. At this point, once Team A starts has lost a person, the action shifts. Now the remaining players can begin moving between corners. However, they are only allowed to throw the ball once they’ve reached a corner (marked by boards as seen in the photo below). This adds more dynamism to the game. Game play goes by innings, with each team taking a turn. Points are scored for hitting the opposing team’s players. When all four of your players have missed, your turn is over, and Team B now goes on offense. But there is an additional twist. When there is only one player left on the corners, all the remaining players from Team B enter the square. So now it’s possible to have 5 or 6 bodies in the square – your potential targets have multiplied. I gathered that this was to make it more interesting when the team on offense is down to its final player, as he loses the ability to toss to a partner, or fake a toss before throwing. The teams played three innings per game, within a best-of-3-games series. I only saw competition between two teams, having only about 45 minutes before I had to scram. My friend later told me that there were four or five pairs of teams competing through the day (over about 4 or 5 hours). It’s possible I made a minor mistake on details here, but the above gives you a rough idea for the game. It’s a fast-moving version of dodgeball played with a smaller ball. Rich Stevick goes into richer detail in Growing Up Amish, if you’d like to know more. The youth who play are really quite acrobatic, able to contort and launch their bodies out of the way of an incoming shot. The straw carpet really is necessary, as I saw at least one guy launch himself nearly horizontally and land flat on his back, without even being able to brace his fall. Ouch. Without a cushion, that would have been even more painful than it looked, and possibly bone-breaking. Another note – according to my friend, there is a code of honor of sorts as to what kind of fake throws can be done. As I understood this was about not bringing your arm all the way through on a fake, as that would give too great an advantage to the one throwing, but checking your fake throw roughly halfway. Cornerball is not played as much as it once was. One Amishman told me that was due to the popularity of volleyball. Girls can participate in that game as well, while corner ball is all-male. So volleyball has become the most popular sport at youth gatherings. I later spoke with a graybeard bishop about his cornerball experience. He didn’t play much himself in his younger days, but I could tell he enjoyed recalling the game. He also had some thoughts on why corner ball was less popular now. If I’m not mis-remembering, he felt it was related to the relatively fewer proportion of people farming, cornerball being something traditionally played on the farm. This aligns with what I heard years back – that more farm youth were taking off-season construction jobs. There are about 6 or 7 organized cornerball games like this one per year. It is also played in some youth group meetings. If you ever have a chance to attend one of these not-so-common games, don’t miss it. Huh! Interesting, and scary regarding the need for the thick carpet of straw to reduce the possibility of injury. Nice post on a pleasant Spring day! (At least in my neighborhood). Thanks Alice Mary! It was a lot of fun and I would have enjoyed staying longer. I’ve never played Dutch Blitz. Wir haben ungefähr das Selbe in Deutschland. Es heißt “Eckball”. We have the same in Germany, and every child knows to play it, as it is also taught at school. Interesting Oliver. I do wonder where this game originated and whether there is a common root here. I have to question the “fewer farmers” aspect. 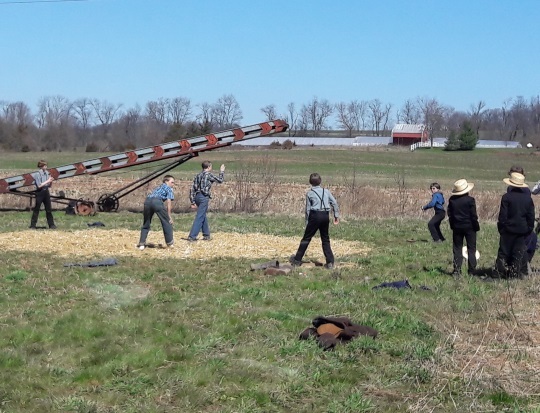 If Amish youth have time to play baseball on a wide open field, than they have time to play corner ball. Plus, the number of Amish farmers has only shrunk relative to their overall growth, rather than there being less total Amish farmers today than say 50-yrs ago. 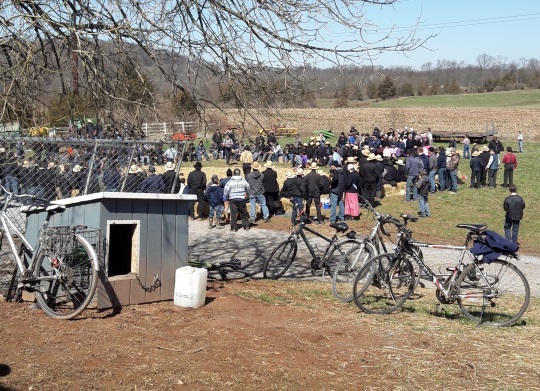 A good guess is that the actual number of Amish farmers is growing. It’s just that the Amish population itself is growing faster and diverging more into other occupations. There are probably others reasons. Baseball for example has long been popular with the Amish even while its popularity has waned among other American youth. Volleyball is another sport that is what not really new to the Amish and has been played among Amish youth for decades (or at least since the 1950s). One way I’ve read it is this (because I’d agree there are very likely more overall households farming in Lancaster County than say 50 years ago even as the % of households involved in farming has decreased). 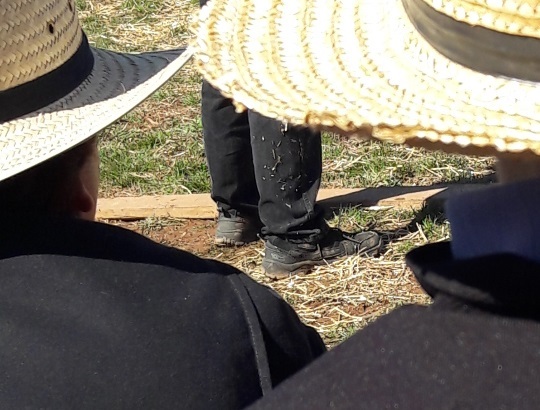 It may be that if the game were traditionally associated with the farming life as something played in the barnyard (Stevick mentions a manure covering under the straw in his account in Growing Up Amish – “Participants prefer playing in barnyards where the winter manure accumulation has softened in the sun. They scatter a thick layer of straw on the area, known as the mosch. It provides them a soft surface to duck, dive, and roll as they seek to avoid being hit.”), when a majority of households farmed, there would be widespread familiarity with the game through the community. 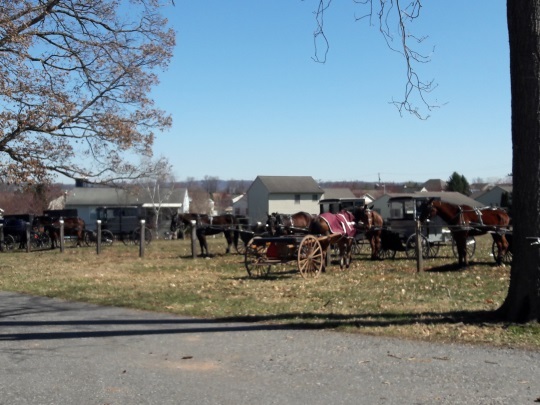 Significantly fewer Amish in the settlement, but if you picked a random Amish home there’d be a greater chance than today that they’d be farming and play the game. As proportionally fewer households played the game this would lead to less familiarity and an opening for other games to become more popular (eg, volleyball). So the game becomes less familiar and less-played proportionally as the settlement grows and the proportion of farmers farming overall decreases (even as their sheer number has likely been increasing). That’s my hypothesis anyway. Unfortunately I didn’t have the chance to go into an in-depth discussion, and if I had I don’t know that we would have pinpointed this as a reason in any case. 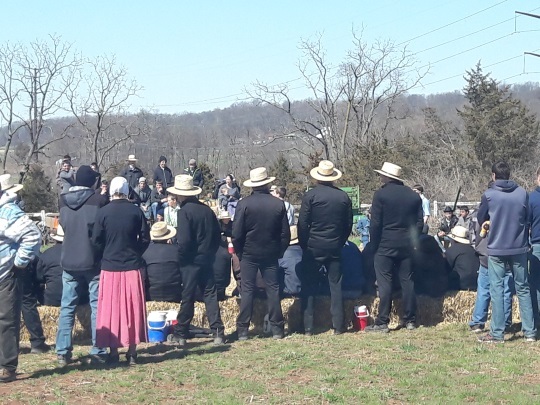 Anecdotally, I have heard that the game is strong among Old Order Mennonites, and I have also separately heard that OOMs tend to stay with farming more than Amish do (vs. going into small business). When I asked about this around 10 years back, the person at the time said that youth taking off-season construction jobs meant it was played less than in the past, with the implication that this game would be something played more frequently during the colder months aligning with the less busy farmer’s schedule in winter (that’s how I described what I’d been told in the original corner ball post: http://amishamerica.com/eck-balle-disappearing-sport-of-the-pennsylvania-dutch/). Interesting game. I imagine getting hit with that little ball would hurt more than the big “dodge ball” which could be quite painful. In talking about the decrease in youth playing corner ball, I wonder how many English youth have even heard of dodge ball, let alone played it. The previous post on this sport was shortly after I had read Growing Up Amish: The Teenage Years, so neither the previous post nor this one was anything really surprising to me. what is surprising is that your previous post on Corner Ball was nearly 10 years ago! If asked I would have said 3,4 maybe 5 years ago. You said it, Oldkat. Almost ten years back surprised me too. Do you have an email address? Would love to chat to you or Rich Stevick more about corner ball. What’s a good gift for an Amish baby?